Oh, Instagram what a crazy game you are. IG doesn’t always make sense, you don’t always get rewarded for hard work, and if you’re on it for too long you can start to feel like you have a giant “L” on your forehead (none of us do, by the way). And don’t even get me started on the new algorithm, WTF? So here’s a classic scenario – I invest precious time to post an informational caption about gut health with a cool video of me doing backflips and receive 10 likes. Solid. Then someone else posts a zoomed in photos of their nails (no caption) and get 5000 likes…in 15 minutes…and all your friends were on their ‘like’ list. Womp, womp. So basically, learn to play the IG game or your business is DOOMED! Not actually, but you get the point. I’m still learning. But on the bright side of this little app, here are 5 tips have learned from some pretty amazing people on there. Disclaimer: it’s important to unplug now and then, and do not play the comparison game while scrollin’. You are beautiful and amazing the way you are! WHAT: Using a hard sponge, your fingertips, or a dry brush, massage lightly in your armpit region. You can do it with soap if you prefer, but just dry or with water works too. HOW: I like to use my fingertips and work my way in towards my chest from my armpit. Sometimes I’ll also massage from the space under my ear, downward – this feels amazing and increases the benefits! WHY: As mentioned, I first saw Lee from America do this, and thus I researched. I learned more than I could have imagined! I didn’t realize that the lymphatic system could be disrupted and overworked if the fluids aren’t moving. Our skin is the largest eliminative organ in the body. By stimulating the lymphatic glands located throughout your armpits, chest, neck, and shoulders, we can help our system eradicate excess toxins. Increasing blood flow and regenerating skin cells will also help heal digestion and even reduce cellulite! Detoxing the body of all the parabens toxins from my lifestyle became a major priority for me after an organic acids test (read: pee test) revealed a high level of parabens in my system. Where do parabens come from? Plastic containers, shampoos, conditioners, lotions and more… and it was truly compromising my system. 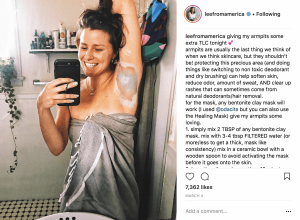 After I stopped using all of the products that could do me harm, I read online about clay masking, not just the face, but the armpits too!!! 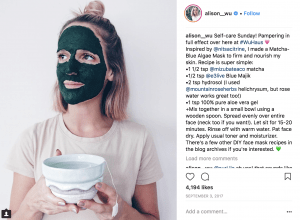 This one may seem like you’ve heard it before like it’s common sense, but sometimes seeing other people actually do it on IG (like Lee and @alison__wu) gives you the push to go try it! WHAT: make wet clay with this powder and cover your face and armpits. HOW: I like to do it after I dry brush, but you can easily do it in any order, especially because you’ll have to shower it off of your armpits anyway. Leave the mask on for 5 to 10 minutes. Before I began using aloe vera juice (link to my post the other day about Aloe Vera! ), Celery Juice was a major part of my healing process (and still is in my routine). I first heard about it form one of my bodybuilding idols, former Arnold Winner Courtney King. 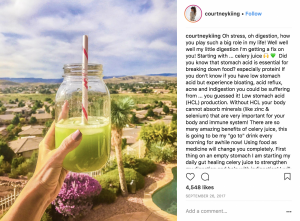 She posted about celery juice benefits and trying it on her own gut health journey, so of course, I tried it too. It truly makes me feel amazing! WHAT: Juicing organic (seriously, make sure it’s organic), celery. You can mix with green apple for more hormonal health benefits and to make it taste better too! HOW: I use a big, industrial size juicer! But, before I got a juicer I used a nut-milk bag. I would blend the celery with a little water and then squeeze the pulp in the nut-milk bag. Courtney has an awesome video on it here. WHY: READ ALL about the benefits in this article I wrote last fall! It’s a miracle vegetable! 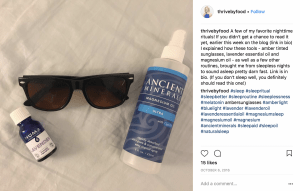 My girl Kristin Thomas of Thrive by Food shared this tip on her Instagram! She claims it induces more relaxing sleep and boy, was she right! You can buy it here, or DIY and it’s pretty quick and easy. WHAT: magnesium helps with smoother skin, headaches and migraines, balanced blood sugar, and it promotes more restful sleep! HOW: Place magnesium oil in a bottle and spray away. Or create your own from Wellness Mama. WHY: For all my active workout buddies, this will help reduce muscle cramps and even some soreness, by replenishing what you lost in sweat. Expert tip: Epsom salt baths work too! But if you’re short on time, try the foot spray and fall fast asleep! Expert tip part II: Put lavender lotion on hands or lavender essential oil in your bedroom at night for deeper sleep! Expert tip part III: @thrivebyfood also advocates the use of garlic oil for anti-microbial benefits. 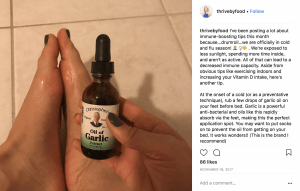 So while you’re down there, rub some garlic oil on your toes as well! Okay, okay, if you’re as annoyed as I was with seeing all the blue packets on IG, get over it – the stuff works! I’ve been biased to Vital Proteins but recently discovered that Bulletproof’s collagen powder is just as good. I found it on sale at Whole Foods and didn’t notice a difference between the two formulas. 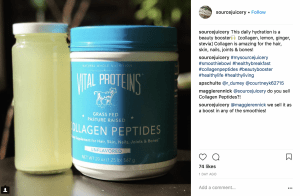 WHAT: Collagen, aka a part of the bone in animals that they hydrolyze and turn into a powder. WHY: Collagen is KEY to healing the gut. If you have any inflammation from eating foods you’re sensitive to, you drink alcohol often or feel some chronic discomfort (read: your stomach is always giving you issues) you probably need to try this. I personally like putting it in my coffee because it helps my macros start off strong (it’s legit 22 grams of protein and that’s it!) and I can’t taste it! Expert tip: Bone Broth is an amazing source of collagen! If you can make your own, try that for gut healing too! Credit: Everyone and their mom on IG. I’ve had client who’ve told me to try it, friends who swear by it, and I’ve even heard about it on the news. But as soon as I saw this health tip being promoted by some of my favorite Instagrammers, I actually decided to try it! It’s ACUPUNCTURE! You can hear me talk more about it here! WHAT: tiny needles activate pressure points in your body that represent organs. For example, the space between your thumb and pointer finger is representative of your gut. Just below the right knee deals with the large intestine. By poking these sticking points, you release energy. In Chinese medicine, balancing energy and releasing tension from organs can and will impact overall health. HOW: tiny needles poke you. These needles are usually painless and sometimes you cannot even feel them! If the organ they are seeking to ameliorate is compromised or struggling, however, you’ll feel more of a pinch or poke for a few seconds, then a very relaxing tingle. reducing a weird lower left hip pain. The hip pain was hard to understand I wasn’t sure if it was my lower intestine or ovaries, nevertheless, the chronic pain went away after three months!!!! For some people, acupuncture has helped back pains, knee pains, fertility issues, and other digestive malaises. 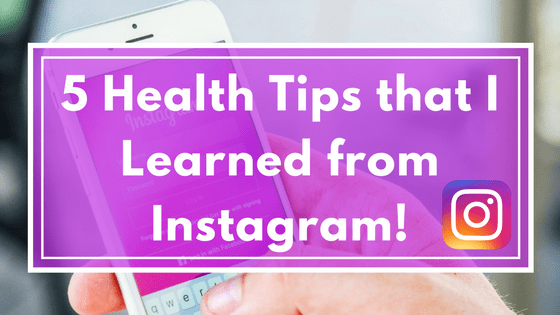 I’m sharing because without the ‘gram, I wouldn’t have found these tips that have truly improved my quality of life. Today, I dare you to use the internet for your health – find books (I recommend Dr. Hyman’s Food: What the Heck should I eat), find recipes, find tips on how to DIY stuff at home! The options are endless. And, if IG frustrates you at times like it does me, finding a life-changing tip is the silver lining!